In this Nov. 1, 2018, photo released by the U.S. Army, soldiers surveil the area during a combined joint patrol in Manbij, Syria. An American military official said Friday, Jan. 11, 2019 that the U.S.-led military coalition has begun the process of withdrawing troops from Syria. The U.S. military says it has started pulling equipment, but not troops, out of Syria as a first step in meeting President Donald Trump's demand for a complete military withdrawal. The withdrawal began with shipments of military equipment, U.S. defense officials said. But in the coming weeks, the contingent of about 2,000 troops is expected to depart even as the White House vows to keep the pressure on the Islamic State group. Once the troops are gone, the U.S. will have ended three years of organizing, arming, advising and providing air cover for Syrian, Kurdish and Arab fighters in an open-ended campaign devised by the Obama administration to deal the ISIS group a lasting defeat. Uncertainty over the timing and terms of the Syria pullout have raised questions about the Trump administration's broader strategy for fighting Islamic extremism, including Trump's stated intention to reduce U.S. forces in Afghanistan this summer. U.S. airstrikes against ISIS in Syria began in September 2014, and ground troops moved in the following year in small numbers. The U.S. military has a limited network of bases inside Syria. Troops work mostly out of small camps in remote parts of the country's northeast. 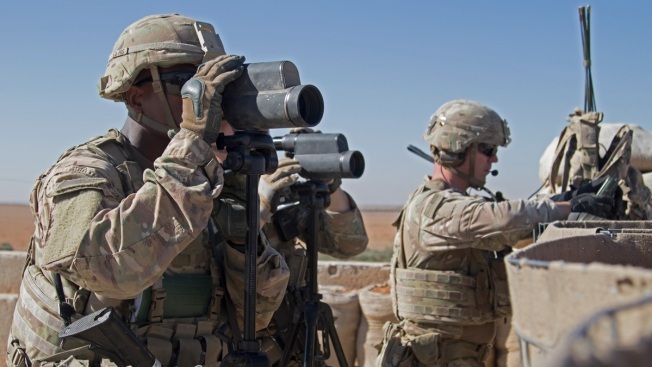 Also, U.S. troops are among 200 to 300 coalition troops at a garrison in southern Syria known as al-Tanf, where they train and accompany local Syrian opposition forces on patrols to counter the ISIS group. Al-Tanf is on a vital road linking Iranian-backed forces from Tehran all the way to southern Lebanon — and Israel's doorstep. Trump's decision to leave Syria, which he initially said would be rapid but later slowed down, shocked U.S. allies and angered the Kurds in Syria, who are vulnerable to attack by Turkey. It also prompted the resignation of Defense Secretary Jim Mattis and drew criticism in Congress. Sen. Jack Reed, a Rhode Island Democrat, called the decision a "betrayal of our Kurdish partners." The U.S. military command in Baghdad, which is managing the counter-ISIS campaign in Iraq and Syria, said Friday that it "has begun the process of our deliberate withdrawal from Syria," adding that, for security reasons, it would not reveal timetables, locations or troop movements. Other U.S. officials later made clear that the pullout did not yet include troops. U.S. troops are still working with a partner known as the Syrian Democratic Forces to stamp out the last ISIS holdouts in the Middle Euphrates River Valley near the Iraqi border. Trump has asserted that the ISIS group in Syria is defeated, but others have said a continued U.S. military presence is necessary to prevent a resurgence of the group. Two weeks before Trump announced he was ordering a pullout, Gen. Joseph Dunford, chairman of the Joint Chiefs of Staff, said the U.S. still had a long way to go in training local Syrian forces to stabilize areas ridden of the ISIS group. He said it would take 35,000 to 40,000 local forces in northeastern Syria to maintain security, but only about 20 percent had been trained. Another complication is the fate of hundreds of foreign ISIS fighters being held in Syria. The U.S. doesn't want these prisoners to be released once U.S. forces are gone, since they could rejoin the militant cause in Syria or elsewhere. There has been confusion over plans to implement Trump's pullout order amid threats from Turkey to attack the Kurdish fighters, who are seen by Ankara as terrorists because of their ties to insurgents within Turkey. On a visit to Turkish troops stationed near the Syrian border Friday, Turkey's defense minister, Hulusi Akar, reiterated that Ankara is "determined" to fight Kurdish militias it considers terrorists and said military preparations were ongoing. "When the time and place comes, the terrorists here will also be buried in the ditches and trenches they have dug," he said. Earlier this week, Trump's national security adviser, John Bolton, said American troops will not leave northeastern Syria until the ISIS group is defeated and American-allied Kurdish fighters are protected, signaling a slowdown in Trump's initial order for a rapid withdrawal. In Cairo on Thursday, Secretary of State Mike Pompeo said that although Trump has decided to bring troops home, he will keep up the fight against the ISIS group more broadly. "Let me be clear: America will not retreat until the terror fight is over," Pompeo said. Syria also is complicated by the presence of Russian troops who are, in effect, propping up the Assad government, and by Iranian support for Assad. American and Russian warplanes have shared the skies over Syria, carrying out separate— and in some cases, conflicting — missions against the ISIS group and other targets.